I am consistently impressed with the Seattle Sounders FC organization and what they've done in such a short time. 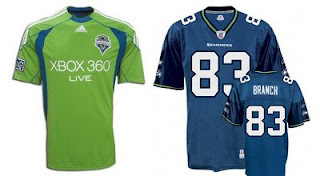 One of the most brilliant moves was to have their colors be very similar to the Seahawks with whom they share a stadium. Given that the Seahawks were there first, the stadium was already decked out in blues and greens. Adopting the Hawks color scheme makes the Sounders look right at home at Qwest field. Same goes for the team store at the stadium. Again, it was already set up for selling blue and green Hawk's gear so the addition of blue and green Sounder's gear is a natural fit. Now, maybe I'm giving too much credit since Seattle is a very blue and green city anyway (see the Mariners) but many other big time organizations have missed such golden opportunities. Kudos to the Sounders FC for doing exactly what made sense instead of trying to reinvent the wheel. And for any team who is trying to create a great atmosphere with their smaller crowds in a huge American football stadium, take a look at the Qwest Field set up during Sounders' matches. 30,000 people in a 70,000 seat stadium never felt so packed and electric!